As we expand the Spark!Lab National Network to Alaska, artist Sara Tabbert provides some perspective on creativity in the state. We have experienced tremendous growth in the Spark!Lab National Network over the last two years. At present, we have Network member sites in Reno, Nevada; Kansas City, Missouri; Pittsfield, Massachusetts; and Anchorage, Alaska. With more interest growing in Network membership, it’s great to see museum professionals, educators, and communities finding value in fostering inventive creativity in kids and families. 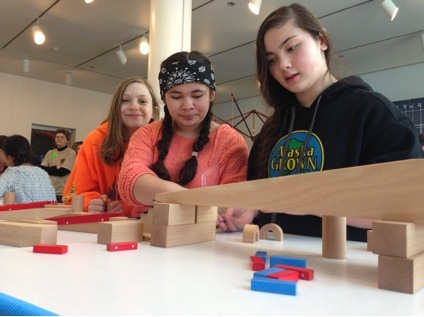 Visitors practice collaboration end engineering skills in Spark!Lab at the Anchorage Museum. Photo byTricia Edwards. Inventive creativity is directing creative thinking towards solving problems, which is what inventors do. In practicing this inventive creativity, kids and families also gain valuable skills, including problem solving, critical thinking, collaboration, communication, and flexibility, just to name a few. It’s also inspiring to see visitors come to an understanding that invention isn’t just about engineering or science, which is a common misconception. Invention is a wonderful intersection of many, many disciplines, including design, art, history, science, technology, and engineering. On that note, I recently asked Alaskan artist Sara Tabbert to provide some perspective on creativity in Alaska, home of our Network member The Anchorage Museum. Tell me a little bit about your art. Most of my work grows out of my training as a printmaker. I love everything about making prints—the surprise, the combination of technical know-how and artistic decisions, the way the ink smells. In the last few years my print work has fallen off a bit due to some larger projects and a competing interest in the carved wood piece (what would often be printed) as the finished product. My goal for 2015: more prints. I’m at the point where working with wood and carving tools has become my way of drawing. I’d rather make an image that way than sketch on paper. It is kind of funny to think about myself in the context of this interview as an “innovator;” hand tools, traditional materials, often small work, a stubborn focus on the beautiful object, and formal art principles are not exactly a recipe for a 21st century "Art Star." I’m most interested in exploring some of the hidden corners of the natural world. I’ve said before that if you set me in front of the Alaska Range on a clear day, I’ll inevitably find a nice stick to draw. It’s the smaller parts of the landscape that hold the secrets I’m looking for. I’ve had some great opportunities with residencies in the National Parks to really dig into this, both in Alaska and elsewhere, and I love the growing recognition that art is a way to connect people to public lands. My work has taken me in some surprising directions over the last 10 years. I tend to say “OK” when people tell me to try something—there was nothing in my portfolio that indicated to me that public art was something that I’d want to do. Someone suggested I start applying, and I’ve had pretty good luck. These projects have been a great experience and now tracking down these opportunities is an important part of my job as an artist. Another surprise came in the teaching realm. I didn’t know that I would be good at or be particularly interested in working with kids, but for the last seven years I’ve done projects at two or three public schools every school year through our state’s Artists in the Schools program. It’s a workout, but I love it. Bring on the kindergarteners. I’m ready. I read somewhere that you feel your art is best when it's "part science and part fairy tale." Tell me more about that! The science and fairy tale idea has to do with my sometimes-conflicting impulses to understand how things work and also to tell a somewhat imaginary story. It’s not overt in my work, but I have a sense that there is a kind of parallel realm in nature that has nothing to do with us. It’s more Grimm’s fairy tales than Disney—and I only catch a glimpse of it out of the corner of my eye every now and then. If you’ve ever encountered a wild animal that seemed completely uninterested and nonplussed with the fact you exist, you might have a sense of that other world. Do we matter in it? Not a bit. What goes on in it when we’re not there? I’m not completely sure, but I like to think about it in my artwork. It’s beautiful, a little cruel, and really remote from our human experience. Or, maybe I spend too much time alone. What about Alaska inspires your creativity? I would say two main things; one artistic, one practical. Although I think I could find things to be interested in as an artist just about anywhere, the endless scope and variety within this state is fascinating. I could probably just travel within Alaska for the rest of my life and still find things that surprise me. My work mainly focuses on the natural world, but the same is true in terms of human culture and activity here. I discover new things all the time. On the practical side, we live in a pretty interesting time to be an artist. It seems more and more apparent to me that we as a culture see attention as the thing that determines value. Artists are encouraged to spend more and more time generating “activity” around their work, which on a practical level can only take time away from making that work. This may sound like a backwards career move, but in choosing to make my career here, I’ve voted by default for a certain level of obscurity. On one hand attention does often equal opportunity. On the other, will any of this matter in 200 years? So long as I can keep my financial head above water, isn’t it making the best work the most important thing? It’s probably a little easier to keep my attention focused on the work I’m making here than other places. Also, we have a bit more freedom to make different choices in terms of lifestyle in Alaska without being judged for it. The reason I can have a really, really nice studio is because living in my house is often a little bit like camping. (Good thing I like camping!) I’m not sure you could get away with living with no plumbing and in an unfinished house for 12 years very many other places. We put money where it matters professionally and will deal with the rest over time. Do you have a story about the intersection of invention and art? Share in the comments! The success of Spark!Lab led the Lemelson Center to establish the Spark!Lab National Network, an active community of museum professionals who foster inventive creativity in families in their own neighborhoods. Much like other thriving communities of invention, fiber arts encourages experimentation, tweaking, failure, and entrepreneurship. Here are my top five favorite discoveries. Charles and Ray Eames and their associates brought color, motion, and life to Smithsonian exhibition halls, and helped museums in general become modern educational organizations.